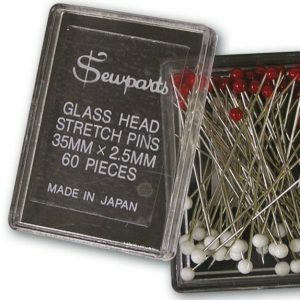 These Stretch Pins are made in Japan of the highest quality Stainless Steel making these pins fine, sharp and very strong. Being 35mm in length and fine shaft, pinning pattern pieces to knit / stretch fabrics is a lot easier. They also will not cause damage to delicate knit or stretch fabrics becuase the tips are a smooth ballpoint which will slip between the fibres rather than catching and splitting the fibres like sharp-pointed dressmaker’s pins will do. Further these pins will not melt under a hot iron. 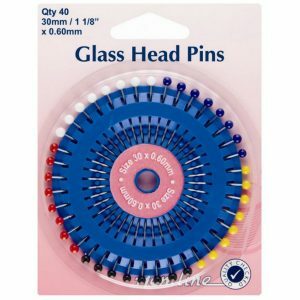 Glass Head Pins: Nickel 34mm 40pcs. Premium quality nickel plated steel with glass head. Shorter length pins for general use. Heads not affected by a hot iron. Traditional pin wheel. 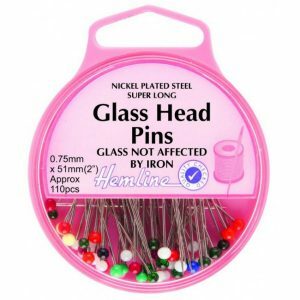 Glass Head Pins: Nickel 34mm 95pcs. Nickel plated steel with glass head. Heads not affected by a hot iron. Essential when ironing hems, pleats etc. 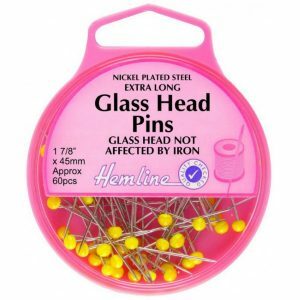 Glass Head pins (Extra Long) 51mm long, 20g pack. Will not be affected with hot iron. 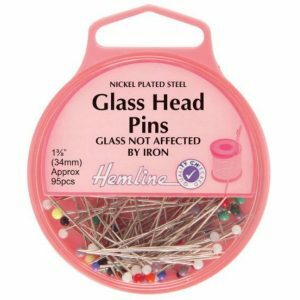 Glass Head Pins: Nickel 45mm 60pcs. Extra long. Nickel plated steel with glass head. Heads not affected by a hot iron. Easy to see yellow heads. Ideal for quilting.